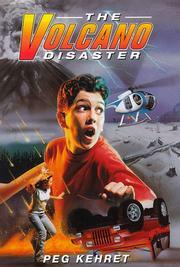 The Volcano Disaster, Peg Kehret (1998, 36 pages) is a slam dunk of a book for a reluctant middle grade reader. This is the first in a series of three books Ms. Kehret wrote in which main characters Warren and Betsy face natural disasters. The next is The Blizzard Disaster, (my review) followed by The Flood Disaster (my review). If kids want more calamity in their life, they also might want to check out her Earthquake Terror, and Escaping the Giant Wave, which are not time travel books but sound equally exciting. Warren is in sixth grade. His dad died unexpectedly six months before the book begins. Of course he is still grieving. In addition to the changes this loss entails, his mother has decided he should move in with his grandmother for a time. He moves into his late grandfather’s study. His reluctance to adjust to living with his grandmother changes to curiosity as he discovers the interesting inventions and accompanying notes his grandfather left. One invention is the aptly named “instant commuter”. The device is about the size of a shoebox and fits into a backpack. You touch the tip of the wire protruding from the box to any place on a map and are instantly transported there. But Warren and his classmate Betsy don’t know two important things about the invention. Number one, that it also works with photographs. Number two, that in addition to allowing one to travel through space, the device also allows one to travel through time. They discover this the hard way, when they accidentally touch the probe to a photo of Mt. St. Helens, May 18, 1980, minutes before it erupts! I was on the edge of my seat as Warren and Betsy tried to outrun the exploding volcano. I love a book with no “throwaway” words, and this is one. It’s as if the author wrote the story and her editor told her, “Okay, now cut it in half, leaving only the best parts.” Without giving the ending away, I can say I also liked the way facing the volcano helped Warren come to terms with his father’s death. This entry was posted in Book reviews and tagged kids' time travel stories, middle grade fiction, Natural disaster, Peg Kehret, time travel books for children, Volcano Disaster. Bookmark the permalink. How odd that I don’t have this one in the library! I have almost all of Kehret’s other books. I’ll have to look in to this one. I thought it was so much fun.